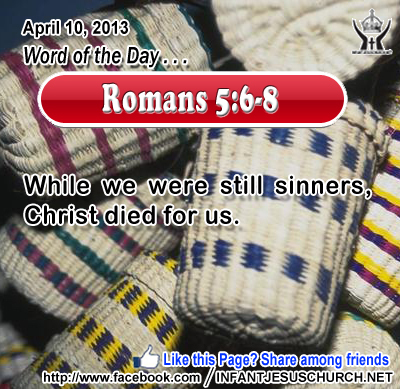 Romans 5:6-8: At just the right time, when we were still powerless, Christ died for the ungodly. Very rarely will anyone die for a righteous man, though for a good man someone might possibly dare to die. But God demonstrates his own love for us in this: While we were still sinners, Christ died for us. Heavenly Father, thank you for Jesus, our Savior. No words are adequate to express our love and devotion to you for such an incredible gift! Through him we give our thanks to you. Amen. 16For God so loved the world that he gave his only Son, that whoever believes in him should not perish but have eternal life. 17 For God sent the Son into the world, not to condemn the world, but that the world might be saved through him. 18 He who believes in him is not condemned; he who does not believe is condemned already, because he has not believed in the name of the only Son of God. 19 And this is the judgment, that the light has come into the world, and men loved darkness rather than light, because their deeds were evil. 20 For every one who does evil hates the light, and does not come to the light, lest his deeds should be exposed. 21But he who does what is true comes to the light, that it may be clearly seen that his deeds have been wrought in God. Jesus shows us the contradiction of love and judgment. We can love the darkness of sin and unbelief or we can love the light of God's truth, beauty, and kindness. If our love is guided by what is true, and good, and beautiful then we will decide for God and love him above all else. What we love shows what we prefer and value most. Do we love God above all else? Does Jesus take first place in your life, in your thoughts, affections, and actions? Loving Jesus, your love is better than life itself. May your love consume and transform our heart with all of its yearnings, ambitions, fears, hurts, and concerns, that we may freely desire you above all else and love all others liberally for your sake and for your glory. Make us to love what you love, desire what you desire, and give generously as you have been so generous towards me.